Improve safety with in swimming areas for children – which Reduces chances of cuts. Restores water flow to lake fed lawn– sprinkler system intakes systems and suction. We provide zebra mussel survey services for lake associations, cities, parks, and any organizations that need their lake inspected for zebra mussels. Additionally, if zebra mussels were just recently discovered in your lake, we can search and inspect the lake to determine if there may be other places that zebra mussels are located. 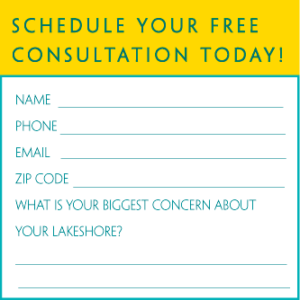 We can do follow up surveys throughout the season if requested. For more information on this service, please contact us here. For additional information regarding zebra mussels see our "Zebra Mussel Cleanup For Homeowners" section. Q: WHAT PROCESS DO YOU USE? SCUBA technicians survey the lake bottom or swimming area of structures that are coated with sharp, dangerous zebra mussels. Dock poles, boat lifts and other areas that have clusters of shells stuck to their surface are removed manually by scraping with specialized equipment and brushes or by using high pressured hot water. In swim areas, zebra mussel encrusted rocks that are small are removed or relocated out of the swimming zone. Zebra mussels are dislodged from the remaining larger rocks or structures with brushes. For most of the zebra mussel services outlined, the area must be free of weeds before commencement of work. *IMPORTANT NOTE: The razor-sharp edges of zebra mussel shells make footwear a must when swimming, engaging in shallow water recreation or walking the beach. Even after zebra mussel cleanup services are performed, it is strongly recommended to wear protective footwear within the area. Q: WHAT IS THE HISTORY AND LIFE CYCLE OF THE ZEBRA MUSSEL IN MINNESOTA? Zebra mussels are believed to have come from the Caspian Sea in Europe. They arrived in the late 1980s in the ballast water of ships. 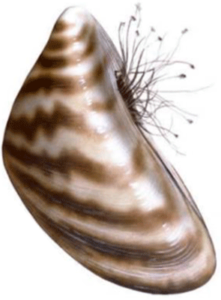 They have striped shells that look like a zebra's stripes, which is how they got their name. Zebra mussels have spread to 20 of the United States and the Provinces of Ontario and Quebec. Zebra mussels were discovered in Minnesota in the Duluth Superior Harbor in 1989. In 1992, they were found in isolated pockets of the Mississippi River. 2003 was the first time they were discovered in a Minnesota inland lake: Lake Ossawinnamakee. In 2005 they were found on Lake Mille Lacs, and in 2010 on Lake Minnetonka. In Minnesota, as of December 11, 2014, there are currently 212 water bodies infested with zebra mussels. Larvae (veligers) emerge 3 to 5 days after eggs are fertilized. Veligers are about the diameter of a human hair - so small you can't see them without a microscope. Veligers free float for up to a month, then start to settle and attach to any firm surface using "byssal threads." Veligers can experience upwards of 99% mortality due to hypoxia, temperature shock,and failure to locate a suitable substrate while settling. Juveniles are able to detach and reattach to substrates by means of byssal fibers near their foot, but as they approach adulthood and sexual maturity, they become sessile (permanently attached). It can take up to 240 days for the juvenile to reach adulthood, and begin to reproduce. Only about 2 percent of all zebra mussels survive to adulthood. They filter up to a quart of water per day as they feast on plankton and algae, thus competing with fish for food, This filtration also increases water clarity, which might cause more aquatic vegetation to grow at deeper depths and more dense stands. Dense algae blooms may develop as a result of zebra mussels rejecting blue-green algae while consuming green algae and other “good” algae that feed on it. The blue-green algae can be toxic to wildlife and pets. The mussels grow to their maximum size (2 inches) by the first year, and can live up to 4 to 8 years. Water intakes and pipe networks are ideal mussel habitats. The continuous flow of water into intakes and throughout the piping system provides the mussels with a continuous source of food and oxygen, while the structures themselves protect the mussels from predation and ice scour. Adults have a difficult time attaching and remaining attached when water velocities exceed 6.6 ft. per second, but in the case of good irrigation system design, velocities of 5 ft. per second will not be exceeded. They are rarely found in areas with strong wave action. When zebra mussels die, they detach and are carried downstream where they can end up trapped at the base of a sprinkler head. The annual cost on the Great Lakes to control zebra mussels in water intake pipes is $250 million. Diving ducks, freshwater drum (sheepshead,) and other fish eat zebra mussels, but will not significantly control them. Since 1999, 75,000 fish-eating birds, including 9,000 loons, in the Great Lakes area have been killed by zebra mussel-induced avian botulism. A body of water with no detectable zebra mussels one year may have its bottom covered with them the next. Zebra mussels can be found throughout the water body because depth (up to 75 ft.), lack of sunlight and winter temperatures are not regulating factors. 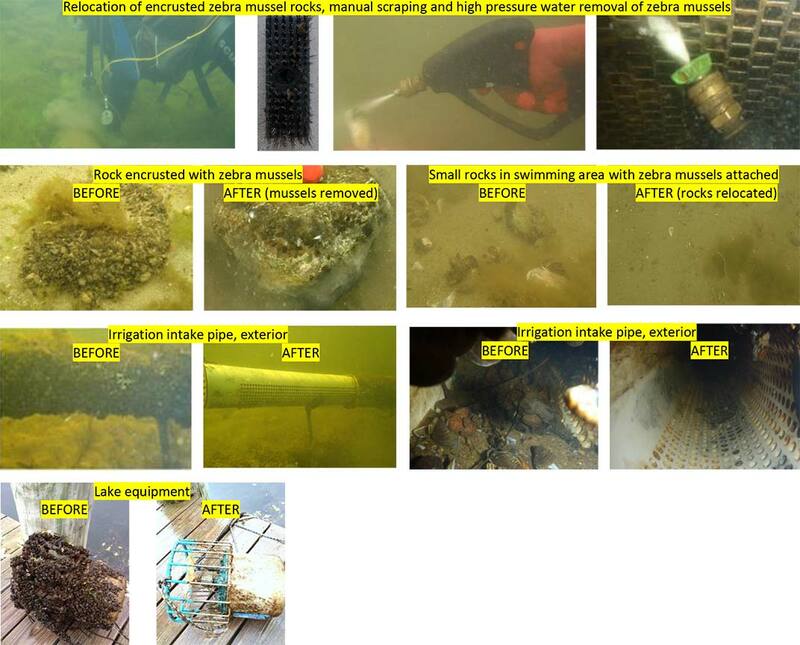 Continued attachment of zebra mussels can cause deterioration of wooden, concrete and even steel objects, affecting their structural integrity. Periodic scraping or chemical treatment is necessary to prevent this.